I've assembled a collection of small cannons and mortars currently fitting on a 30 inch wide shelf seen above which sits just above my desk. The shelf was purpose built to house them with lighting and a removable plexiglass front to keep them clean. I'm hoping to limit the collection to eight total, but time will tell! My golf ball mortar is fairly large and won't fit the shelf so it's not in the family photo above but is detailed below. Some of these pieces are for display only, others do get fired...all CAN be fired. I have photographed most with an 1878 Morgan Silver Dollar beside them for relative size. If you are not familiar with the Morgan Silver Dollar, it spans 1.5 inches (35 mm). 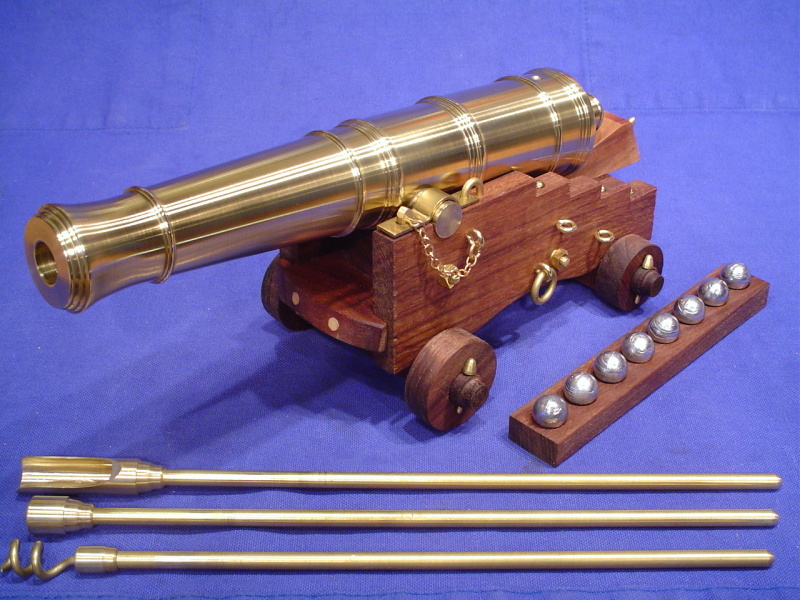 I purchased this beautiful handmade brass model cannon from a gentleman named John Joline and I couldn't be happier with it !!! This specific model is his "Large 24 Pounder", referring to the weight of the cannon balls the originals fired. Back to the 24 pounder... a 1:10 scale museum-quality black powder firing model cannon faithful to the design of the original. I also opted for the 3 piece brass tool set, walnut ball rack and set of lead balls...all made to the same quality standard as the 24 pounder. The 11.2 inch barrel is machined from solid industrial brass bar...not a casting, and it WILL fire the cast lead .56 caliber balls, so it's definitely not a toy. The wooden carriage is made of quality American walnut and the metal hardware is solid brass. 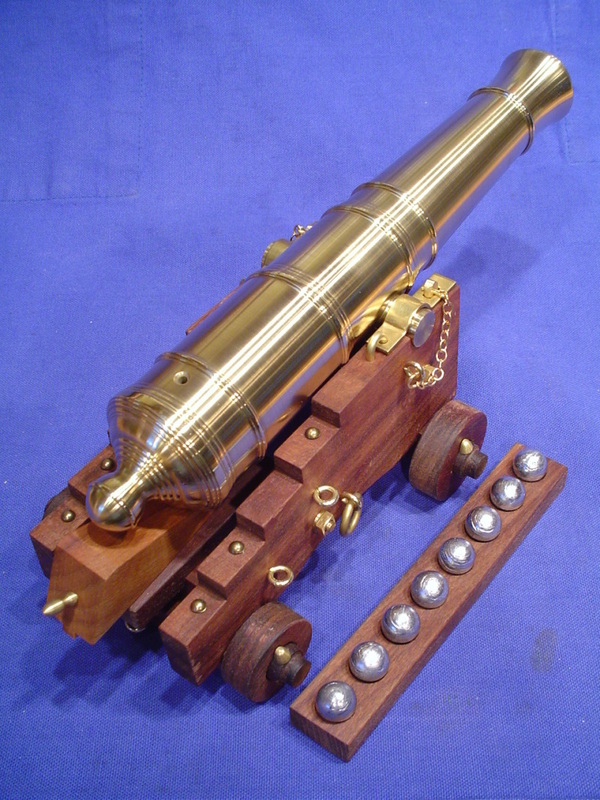 The bore size is a over one half inch diameter and the model weighs a hefty 9.25 pounds overall. I kind of like the fact that it's 100% American Made of American sourced materials by an American modeler. Scale: 1:10 Length: 12" Caliber: .56 Barrel length: 11.5"
Width: 4.75" Weight: 9.25 lb. Toolset Weight: .75 lb. Though built to be fired, this one is too pretty and I want it to stay that way. I have other lesser cannons and mortars for actual firing. 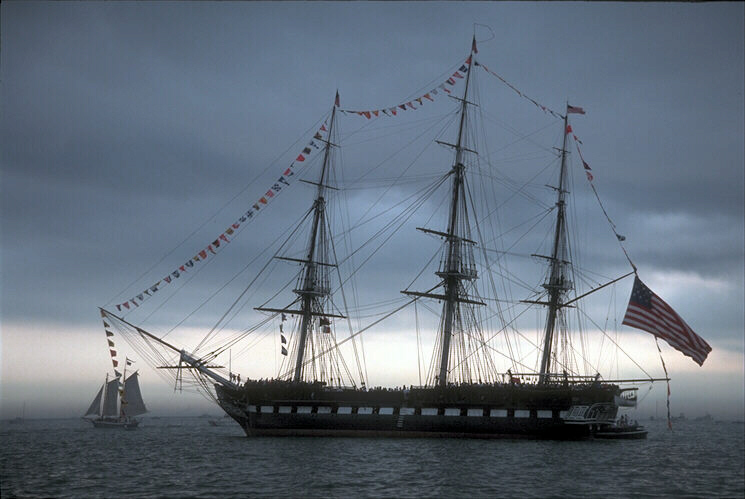 Two centuries ago, freedome of the seas was an empty expression unless you had the strength to ensure your freedom. In the early years of the United States, it was the Naval 24 pounder and the ships that carried them, that commanded respect for the new republic. Privateers, Barbary pirates and British ships-of-the-line all learned about the severe damage that these long, powerful guns could inflict upon them. American naval construction in these early fragile years was concentrated on building a class of frigates that were bigger, stronger and more heavily armed than the ships of other navies. The U.S. frigates could outrun and outmaneuver the ponderous ships-of-the-line that could defeat them. Any hostile ship that might be fast enough to catch the U.S. frigates would become easy prey under severe broadsides from the American ships. 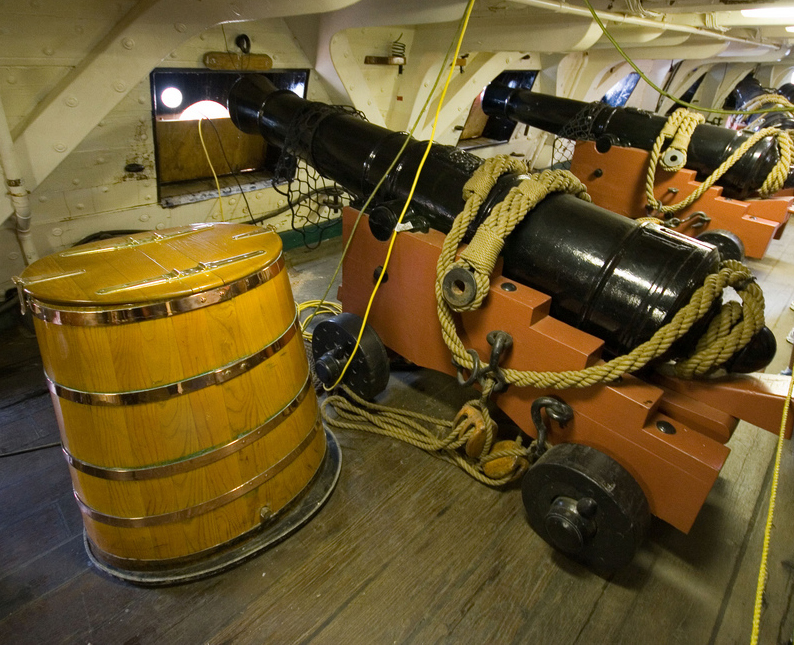 The U.S.S Constitution (Old Ironsides), the vessel show abov e and from which this particular cannon was patterned, was one of the very first frigates to use the 24 pounders. The gun arrived at it's name by the 24 pound cannon ball that it fired. The Constitution carried thirty of these long guns as it's main battery on the gun deck as well as using them aft for stern chasers. Typical of the American-made Naval guns of the period, the 24 pounder was lighter and had longer range than similar cannon used by foreign navies. Ideally, the 24 pounder would be served by a gun crew of 10 to 12 sailers. The casualties of battle would too often reduce this number, sometimes leaving no more than 4 or 5 of the original gun crew keeping the piece in action. A full, well-trained crew could fire, swab the bore, load the 6 pound charge of black powder, load the 24 pound round shot, ram this home, run the gun out, aim and fire again all in about half a minute. This was a rate that was almost twice as fast as the Spanish and French frigates of the day. Although they were equaled by the British in the high rate of fire, the Americans relied more on individual gun-aiming than the opponents in the Royal Navy, thereby gaining an important advantage in accuracy. The Yorktown Mortar gets it's name from a very similar design used by George Washington and his allies during the battle of Yorktown. That battle was pivotal to a young America winning it's independence. The original mortar this is based on fired a hollow cast iron ball filled with black powder. In effect this ball was a fused bomb fired at a high angle that fell behind enemy lines exploding just above ground level. The burst of the charge in the ball broke it into many shapnel like fragments causing catastrophic damage to an enemy that feared and respected these weapons. This model is a 1:10 scale brass and American walnut version accurate in every detail of the originals. John has even made period correct square nuts used throughout the model. Scale: 1:10 Length: 5.5" Caliber: 1" Barrel length: 3"
Width: 4.5" Weight: 3 lb. Although fully functional like it's brother the Naval 24 pounder, I plan to keep that Joline built cannon and this mortar as display pieces only, they are just too beautiful to get dirtied up with blackpowder. I have several other models which I have fired and enjoy the process immensly. THEY will defend the Temple of Steam! OK...I needed this like a hole in the head, but the company name "Pocket Cannon" intrigued me. This cost under $30 from a mail order outfit by the same name. When I ordered mine they had it available in "BB" caliber only. I found that to be a bit disappointing, so I had a friend with a lathe ream out the bore to a more respectable .30 caliber. Funny, the outfit making them soon offered a .30 caliber version as well...but I was there first!!! As seen above and below, I mounted the works to a block of marble scavanged from a Cub Scout trophy...this gives it more stability and avoids tendency of the unweighted/as sold version to flip over backwards when fired! I made a little display of .32 caliber balls glued to the marble base just for show. I have found that .32 caliber lead balls sold for blackpowder rifle use work great, shaving off the extra couple of thousands when you press them into the bore with a short piece of wood doweling. Great fun for very little money...just be sure to get the .30 caliber version if you order one. YES, it is called a golf ball mortar and it was expressly built to fire golf balls over 200 yards. Of all my mini cannons and mortars, this one has gotten the most use and made me laugh every time I fired it. What appealed to me about this mortar is the cheap ammo, it gives off a hell of a bang AND the white balls are so big you can see the darn things in flight which is very cool. As pictured above, it features an adjustable lever on the side so you can change the angle of firing and also remove the barrel for hot water cleanup in the kitchen sink. Given I plan to use this a lot, I gave it an extra coat of Rustoleum hammered paint, mounted it on a nice wood base and even painted a golf ball for display. In just two months, I've fired it more than 30 times. It's a crowd pleaser! Dom, makes all manner of cannons and mortars from little to full size...he is a superb fabricator and the welds on even this little mortar were first class. Notice how he included a powder chamber in the very bottom of the bore and included holes in the base which are needed to bolt it down for firing. To load and fire, I point it straight up, insert a firecracker type fuse in the touch hole and extend it into the powder well. Next, add 1.5 teaspoons of FFg Pyrodex black powder substitute to fill the powder chamber. A golf ball is patched with a 3 inch sq., double layer of old cotton tee shirt cloth and pressed in with a heavy dowel til the ball sits firmly on the powder. Adjust angle as desired, light the fuse and get out of the way. After each shot, clean out the residue, swab the barrel to ensure no hot embers remain and reload if desired. At the end of the day, the barrel removes for hot water cleanup in the kitchen sink. I then spray the insides with a rust preventative spray which as seen above is keeping things nice and bright. We've had a mild winter 2011/12 in central Indiana, so my son and I got out for a day of shooting at my local shotgun range (I think of a mortar is a short shotgun!). Here's a video taken Feb. 3, 2012 ...again, it makes me laugh every time I shoot it and it will probably be the blackpowder piece I enjoy the most. 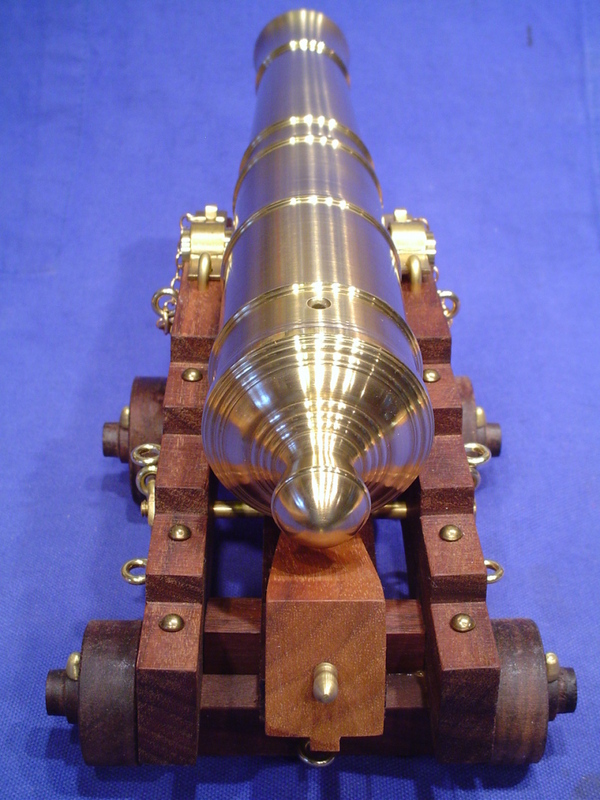 I have a real love for this cannon, I have owned it since the early 1970's when I bought it from my physics professor at Nasson College in Springvale, Maine...a sweet old eccentric gent named Mel Landon who built it himself. It's barrel is about 5.5 inches long, the bore is 0.395 inches and it fires .40 caliber lead balls. As I remember it goes off with a superb BANG! I must refresh my memory. Professor Mel supposedly turned the barrel from the propeller shaft of an old coastal Maine boat as our school was near the ocean. This cannon was fired many times in the early years I owned it, then I misplaced it for about 30 years only just finding it again in 2011. I cleaned up the wood and polished the brass to once again make it look like it did nearly 40 years ago..."patina" does nothing for me! At least for now, it's for display not firing. This little fellow is nowhere near as perfect as the cannons and mortars built by John Joline, but it has a homey feel to it that brings me back to my college years when I thought this was just such a neat toy. Look at the top rear above...despite my recent polishing, it's pitted around the touch hole, evidence of ample use years ago. Dang I have such good memories of shooting this thing, nostalgia is a powerful force. Mel you are probably pushing up daisies by now, but your handiwork lives on...it will shoot again !!! To show I take good care of my favorite toys, here is my very first cannon...a cute little thing sold as a souvenir in the gift shop next to the U.S.S. Naval ship Constitution docked in Boston, Mass. The Constitution was nicknamed "Old Ironsides" for it's iron reinforced hull and as of this writing is more than 200 years old and in a remarkable state of preservation and restoration. I was about 12 years old and on a school day trip when I picked this up. I imagine when I bought this it was just a few dollars...now I see the exact same ones selling on eBay for $25 and up...50 years worth of inflated currency and memories I guess. I won't be selling mine! Now 50 years later this little "souvenir" cannon graces my website and is part of the collection I look at daily just above my desk. Being from anti-gun Massachusetts , these little cannons were sold as "non-firing/unable to be made to fire" because the trunnions passed completely thru the bore blocking it. Well, being a determined 12 year old, I solved that blockage problem with an electric drill in about 2 minutes, extending the bore back to the touch hole and clearing the way for actual firing. I initially made up suitable "powder" using match heads and later refined my technique using the contents of firecrackers. It's bore is a bit bigger than a BB or pellet, so I had to improvise with little glass balls I found to fit. Dang that baby worked great!!! The whole cannon flipped end over end with every shot, but it could take out a toy soldier at 12 inches with ease and thrill this little boy every time ! Whoever claimed these cannons were "Unable to fire" hadn't met a determined 12 year old boy !! !